The Mother & Child pendants are inspired by the Stained Glass windows called “Suffer Little Children” designed by Harry Clarke for St. Patrick’s Church, Donabate, Co. Dublin. A local group of artists worked together as a group and created different pieces inspired by the windows. The word “suffer” here means allow. 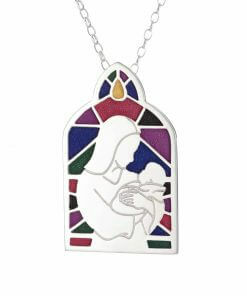 Tracy’s design captures the bond between a mother and child while also touching upon madonna and child imagery. The mother and child are the centrepiece of a window patinated in different colours to capture the wonderful effect of the stained glass windows. This Mother and Child pendant is meticulously handcrafted in sterling silver with love for Irish roots, history and folklore. It comes on a sterling silver chain. The pendant comes in blue and green and Celtic spirals (triskele) feature at the back of each piece.